As the Summer is drawing to a close and we’re all back to work, it’s a good time to review what has been achieved this year from a training and development perspective, what the gaps are and of course, whether the all essential CPD points have been achieved. Are you looking to enhance your capabilities in your financial services role? Do you need to get up to speed with the latest regulatory developments? If so, take a look at these key courses we’ve selected for you below. We run courses with limited class sizes to ensure you get the maximum input from your trainer. In addition, all of our consultants have extensive industry experience so they know what’s going on in the professional world and understand the challenges you face in your day to day role. 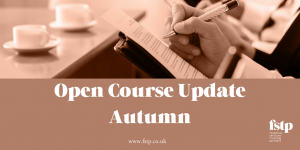 Our courses consistently receive positive feedback from attendees and are continuously developed to ensure that the content is kept up to date. This two hour briefing will ask you one essential question: is your governance structure robust enough? This course is suitable for Executives / Non-executives, senior managers and Heads of function. Join us to gain an insight into the regulator’s expectations and pinpoint the responsibilities of individual board members, helping to keep your firm on the path of ethical and compliant profits. Course details and booking here. The regulator has exposed serious weaknesses in the way some financial services firms approach product design and governance. It has urged businesses to introduce rigorous stress testing to prove the value of products, and to give clearer information to the customer about the risks involved. No one can afford to be out of step with the latest regulations. This intensive one-day course has been designed for: staff with compliance functions and employees needing to ensure regulatory standards are met. In this interactive one-day course you’ll learn how to truly place your customer at the heart of your product policies and develop the framework that allows you to prove to the FCA you did so. Client file management matters a great deal and the FCA expects you to be able to demonstrate the advice you offer is suitable. You need to make sure suitability is not only evidenced in client files but can also be demonstrated across your business. While there has been some improvement in recent years (due to their focus on suitability), the FCA still routinely uncovers poorly documented client files causing potential reputational damage. This is a highly practical and interactive workshop, led by an expert in communication. The group size is a maximum of 14 so that you have the opportunity to debate and explore how techniques you will learn can be used in real life, and also derive the maximum personal feedback to fuel your development. The best negotiators are subtle, fair and know what to give away, when to make demands and how to compensate when there are difficulties. They achieve lasting results and gain real commitment from people.